Monday August 29th 1892 I was up town this morning to get things for Mrs Duncan she had Joes family over for dinner. About three oclock Will took Mattie, Mrs Adams and I for a ride. We got back at five oclock just in time to escape a rain and found the friends all there and a fine supper ready. Joe & Mattie were completely surprised and the party was a most enjoyable one. Tuesday August 30th 1892 Mary Woolf was over this morning before going to the country. The rain kept her and Gene away last night. After she went I called on Mrs Baker. After dinner Will and I went over to Genes and she went with us out to Shorts where we stayed till after supper. It was nearly bed time when we got back to Duncans. Wednesday August 31st 1892 It was a splendid day. Will and I called at Dovedrove and then went to Will Duncans for dinner. In the afternoon we came back to town by John Shorts place and spent the evening with Eva Taylor and her husband. 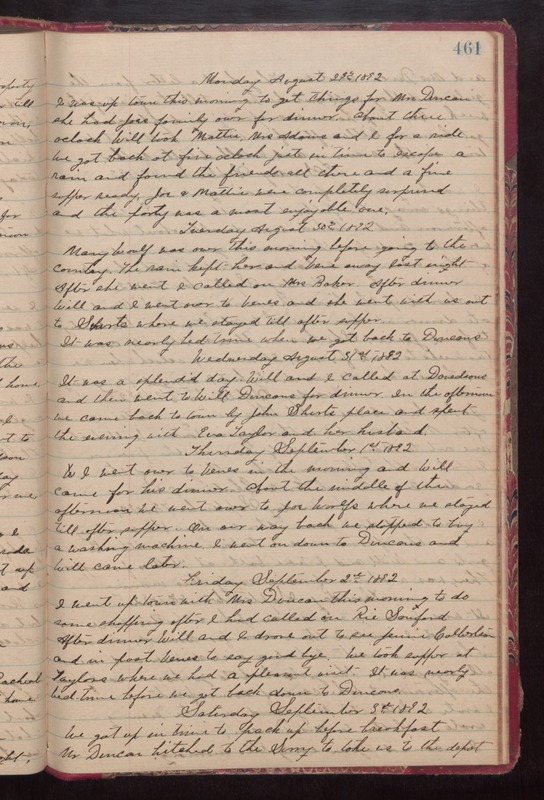 Thursday September 1st 1892 I went over to Genes in the morning and Will came for his dinner. About the middle of the afternoon we went over to Jo Woolfs where we stayed till after supper. On our way back we stopped to buy a washing machine. I went on down to Duncans and Will came later. Friday September 2nd 1892 I went up town with Mrs Duncan this morning to do some shopping after I had called on Ric Sanford. After dinner Will and I drove out to see Jennie Culbertson and in past Genes to say god bye. We took supper at Taylors where we had a pleasant visit. It was nearly bed-time before we got back down to Duncans. Saturday September 3rd 1892 We got up in time to pack up before breakfast. Ms Duncan hitched to the Surry to take us to the depot.